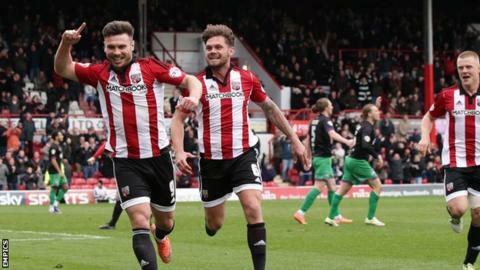 Injury-hit Scott Hogan showed character to score his first goal for the club in Brentford's 1-1 draw with Bristol City, according to Bees boss Dean Smith. After missing a penalty, Hogan grabbed a late equaliser against the Robins. "I'm really pleased for him. He got a well-deserved round of applause in the dressing room," said Smith. The 24-year-old striker suffered a cruciate ligament injury on only his second appearance for the Bees in August 2014, requiring two operations. Hogan returned from 19 months on the sidelines for the west London club last month, having re-ruptured his cruciate ligament last year when close to his first comeback. In his fourth match back, Hogan was initially denied his first Bees goal when City goalkeeper Richard O'Donnell saved his spot-kick with four minutes remaining. However, the former Rochdale frontman notched from close range in the first minute of stoppage time. "He could easily have been distraught after that but he wasn't," Smith told BBC Radio London. "He snapped up a chance right at the death. That is one for him, his family and all the medical team who have nursed him back to full fitness." Hogan's goal was his first since hitting a hat-trick for Rochdale against Oxford United in March 2014, prior to his move to Brentford later that summer on a three-year contract.